Some horse people might believe the mule is an inferior equine, but that's just snobbery and lack of knowledge about this hybrid animal. 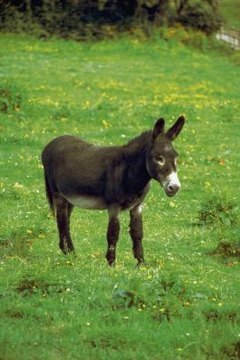 A mule is a cross between a donkey jack and a horse mare. The less common but similar hinny is a cross between a horse stallion and a donkey jenny. Both mules and hinnies are sterile. The longears might not be as beautiful, but they've got numerous advantages over a horse. Every owner knows the danger of overfeeding grain to a horse -- it can result in a potential bout of colic or laminitis. Not only do most mules not require grain, even if in regular work, but they don't tend to overeat it. Although it's a myth that mules don't contract laminitis or the more serious condition known as founder, it is true that they are less prone to it than horses because of their sensible eating habits. Generally, mules need less hay than horses -- and the hay doesn't need to be top quality. Overall, mules tend to be healthier, sounder and live longer than horses. This might result from hybrid vigor, the genetic superiority of crossbred animals. Mules are less prone to injuries because they've got a good sense of self-preservation. While detractors call them "stubborn," in reality the mule isn't going to overexert or overextend himself the way a horse can. Mules usually have good, strong feet that don't require shoeing. It's not a coincidence that mules are favored over horses for packing or riding in mountainous terrain. That's because the mule has a reputation for being more surefooted than his equine cousin. His feet are smaller and more upright than those of the average horse, which contributes to his surefootedness. If you're traveling on a trail with a steep drop on one side, that's a quality you appreciate. Mules also don't panic as easily as horses if they get themselves in tight situations. Horse versus mule intelligence is somewhat subjective. Back in 1957, Sports Illustrated asked some of the top people in equine competition whether a mule or horse was more intelligent. These interviews took place at the prestigious National Horse Show held at New York City's Madison Square Garden. Lieutenant General Blackshear M. Bryan, Commander, First United States Army, replied, "Mules are no exhibitionists, and they tend to be 'cussed and ornery,' as well as 'set in their ways' but, when compared in intelligence to horses, you are insulting the mule. When thirsty, mules will drink only what is necessary, while horses will drink their fill at once if allowed to do so." Adrian Van Sinderen, president of the American Horse Shows Association, responded, "A mule is much safer. I believe I know as much about mules as I know about horses. They're ornery critters and they often do what they want, not what you want. But a mule will take better care of a man." Outfitters Supply: Should I Pack Horses or Pack Mules?